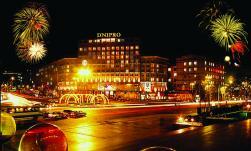 The Kiev Hotel Dnipro, named for the famous Ukrainian River Dnipro, sits nestled in the hills of Kiev. From its highest stories, guests can enjoy a panoramic view of the city - from the Ukrainian House at the heart of the capital to the Lavra bell towers. Nearby the hotel are numerous shops, banks, theatres, and museums along with the Supreme Rada of Ukraine and St. Sophia's Cathedral. 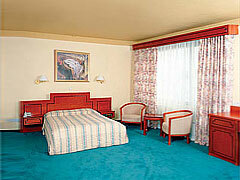 The Hotel Dnipro offers more than 180 rooms of varying degrees. Built in 1964, it was reconstructed in 1992 and again in 1998. 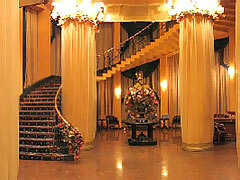 The exquisite Presidential apartments contain two bedrooms, an office, a bathroom with hydro massage, a telephone, satellite TV, a bar, a refrigerator, and a dining room with a full set of dishes. 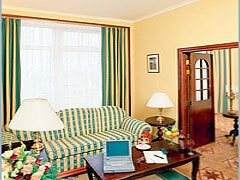 In addition, the hotel offers deluxe rooms, semi-suites, and single rooms. As with many hotels in the city, the single rooms cannot be described as spacious and in reality do not differ too much from the remodeled upgrades. For the additional convenience of the guests, the hotel provides a currency exchange, car rental, airline ticket purchase, a hair salon, a dentist, and laundry and dry-cleaning services. Dine surrounded by the exquisite interior of the Restaurant Dniepr on tasty Ukrainian dishes or try any of the numerous European offerings prepared by their prize-winning chef. 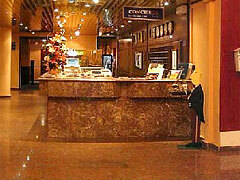 After dinner, dance the evening away in the nightclub or try your luck in the Casino Gabriela. For those who come to Kiev on business, the hotel provides a business center with a telex, fax, and copy and translation services. You can also rent a conference hall for negotiations, conferences and workshops; the banquet hall is available for ceremonial presentations. Location: At the north end of Kreschatik Blvd, 40 km from Borispol International Airport, 14 km from Zhulyany airport, 3 km from the railway station and 0.6 km from the River port.